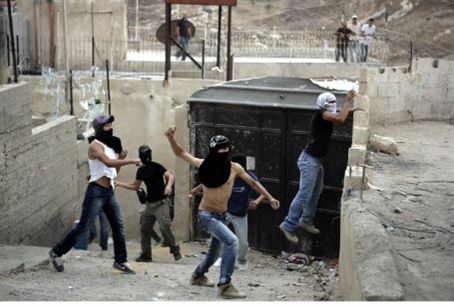 PA terrorists attempted to lynch a Jewish couple as they rushed to the hospital on Yom Kippur with the wife in labor. Palestinian Authority terrorists continued their attacks on innocent Jewish motorists over Yom Kippur, this time attacking a woman in labor and her husband as they rushed to the hospital. The husband, Ariel Goldman of Pnei Kedem, told Arutz Sheva that the two were lucky to escape with their lives. Their ordeal began near Har Homa at 2:30 a.m., as they drove to Hadassah Ein Karem hospital in Jerusalem. Suddenly, they encountered a point in the road that had been blocked by large stones. As Goldman slowed the car, looking for a way around the trap, several Palestinian Authority terrorists jumped out and began to hurl rocks at the car. The attack turned into a game of cat and mouse, as Goldman looked for ways around the rocks and tried to keep moving, while the terrorists followed the car and continued to pelt it with heavy stones, using a tactic that recently resulted in two deaths near Hevron. The terrorists “had murder in their eyes,” Goldman said. He finally managed to pass the stone barrier and speed away from the group of attackers, only to encounter a second group that attempted to stone the car near the Jerusalem neighborhood of Talpiot. Goldman managed to speed away a second time. A policewoman he later encountered appeared uninterested by his story, but promised to notify her superiors, he said. Ariel Goldman and his wife managed to reach the hospital, where she gave birth to a baby boy. Both the baby and mother are in good condition.